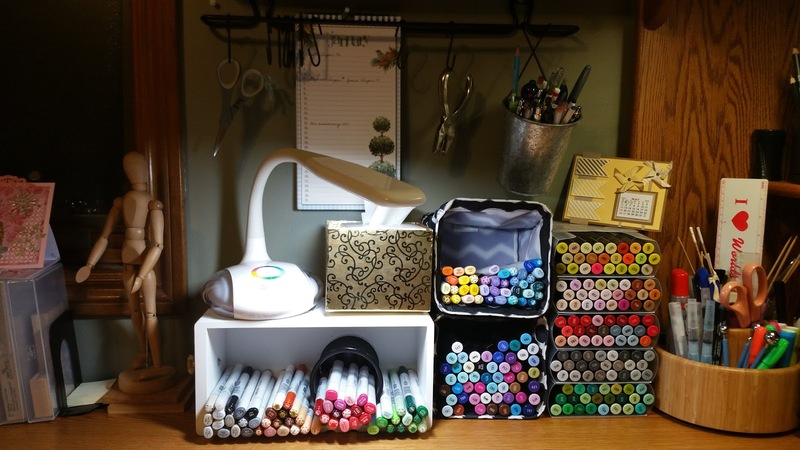 Cheery's Craft Haven: How do you store your markers and pencils? 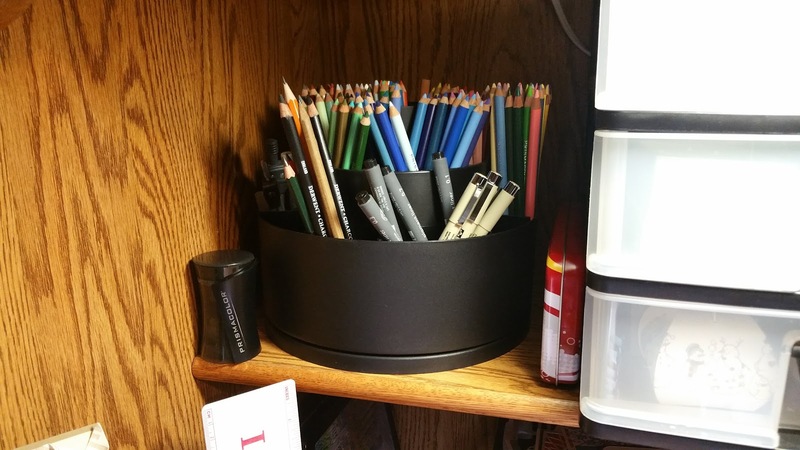 How do you store your markers and pencils? I was asked today how I store my markers and pencils by a young lady whose mom I am friends with. Well, Miss Lavioe, I would love to show you! Here's a little tour of my work space. In this first photo, you can see all of my Spectrum Noir and Copic Markers. I store them horizontally and try to keep them in colour families. Some of the Spectrum Noirs came in boxes that stack very nicely, so I've kept those. The "overflow" I keep in a Littles Tote from 31 Gifts. The Copics are in the white wooden box that my lamp is sitting on, and in the other Littles Tote. My coloured pencils are stored upright in my Pampered Chef tool turn-about, pictured to the right. I mostly use Prismacolor pencils, although I do have Crayola and Caran D'Ache as well. 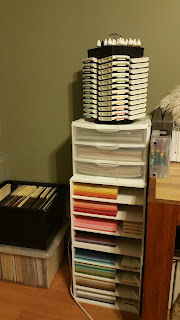 My ink pads are pretty much all Stampin' Up!, so I store them in this caddy, which is from Stampin' Up! The card stock is sorted according to colour family, and the filing box at the far left holds all my scraps of each colour. 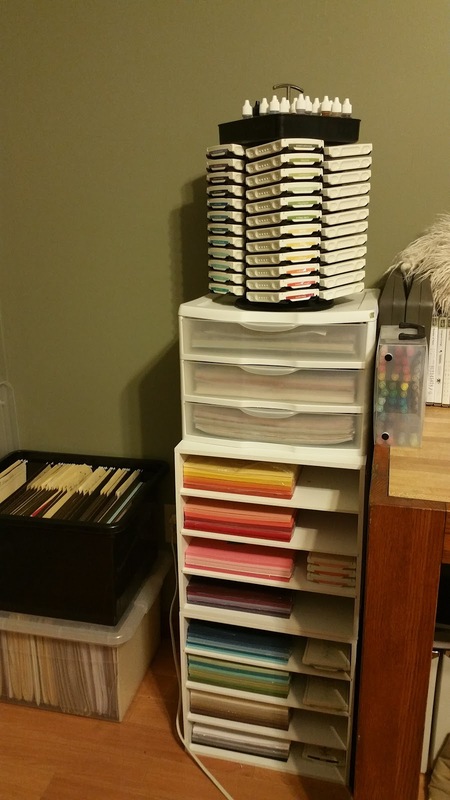 12x12 card stock and designer/patterned papers are in the 3 drawers (I have a 2nd 3-drawer chest elsewhere as well as a bin for the rest of my 12x12's. 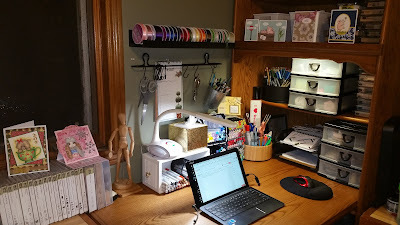 Finally, here is a photo of my most-used work space. This spot is where I do the majority of my colouring and creating.